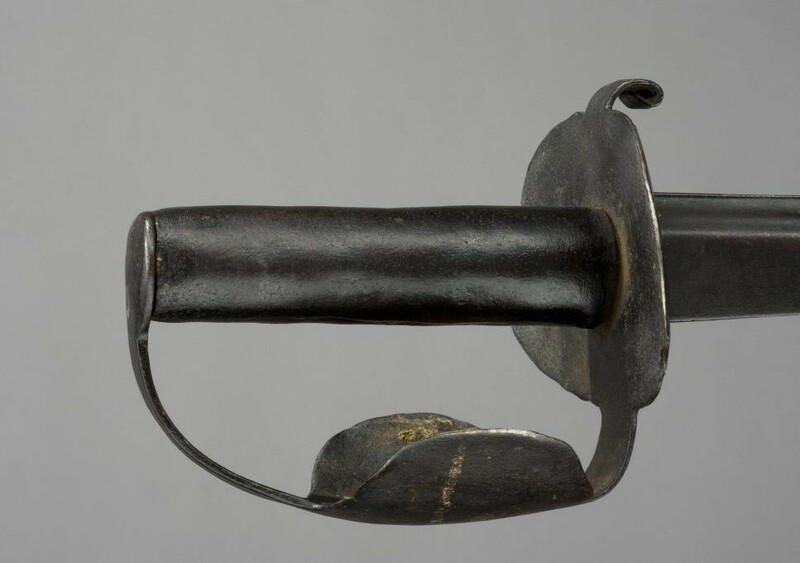 'Figure of Eight' Naval Cutlass, c.1740-1750, Colonial Williamsburg. As I pour through images I find very little evidence of a sailor wearing baldric or scabbard, even if they do happen to have a cutlass in hand. In the instances where they do, it is often in a political piece where the author is clearly taking artistic licence. In what situation if any would a before-the-mast common sailor ever be granted such leeway to carry arms? In this post, I will approach two main questions: how were cutlasses carried, and by whom? MacNamara is right that most images from the period show sailors with naked cutlasses. This is particularly notable in the numerous portrayals of the British Tar at Omoa. In each of these a common sailor is portrayed storming the fortifications of Omoa bearing at least one cutlass, and the image often includes background characters also armed with naked blades, but not a single scabbard or baldric among them. Primary source artwork is of limited use here. 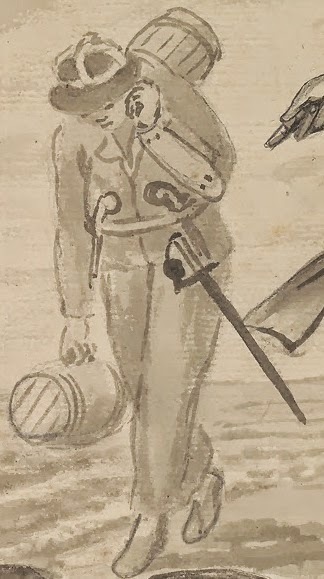 There are many images of sailors with sword or cutlass, but most of these are cartoons and not illustrated by mariners familiar with the customs of the sea. Of the cartoons and other images collected there, it's a pretty even split between waistbelt and baldric, or no method of carrying cutlasses at all. Not exactly illuminating. Even those pieces that are illustrated by mariners are not necessarily reliable or helpful, as is the case with this detail from East India Company mariner William Gibson. The figure on the right holds a sword, but has no visible belt or baldric for sheathing it. Aboard ship, sailors had little need of a scabbard. Ashore was a different story. Sometimes this was for ceremonial occasions. 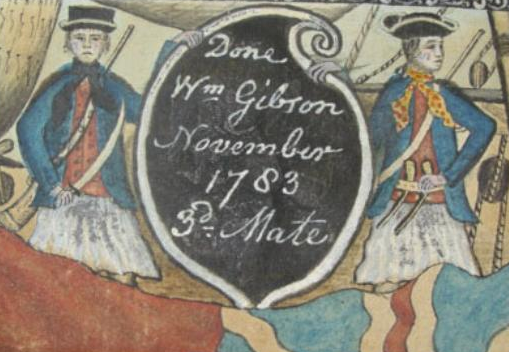 James Wyatt, a privateer writing in his The Life and Surprizing Adventures of James Wyatt in 1753 mentions the carrying of swords for a midshipman's funeral ashore: 'Every one had a Pair of Pistols stuck in his Belt, a Hanger by his Side, and there were Swords cross'd on the Coffin Lid.' Again, he says nothing about precisely how the blades were slung. Gabriel Bray is perhaps the only artist to give us a reliable image of a sailor carrying a cutlass ashore. Bray, unlike most artists I examine on this website, was a naval officer and focused on daily life at sea during his 1774 voyage aboard the frigate Pallas to Africa. In one piece entitled Military Figure Leaning on a Pile of Bales (possibly created shortly before the Pallas voyage) a common seaman is in the background hauling casks. My guess (and I stress it is a guess) is that the sailor was part of a shore party along with the officer who stands as the central figure of the piece, and that the party was dressed and accoutered for close combat in case something went wrong. This would make sense in an anti-smuggling mission. So how common were cutlasses on non-naval vessels compared to men-ofwar? Archaeology can be of some help here. Looking through archaeological reports for non-naval vessels the General Carleton (merchant), Defence (American privateer), and Philadelphia (American gunboat) made no mention of recovered swords, cutlasses, or associated leather gear. Matthew Keagle, curator at Fort Ticonderoga, weighed in on the collection drawn from the sloop Boscawen. 'Somewhat to my surprise I don't believe there were any cutlass parts or belting recovered from the wreck. To a certain extent this doesn't surprise me, as it was built and manned largely by army personnel.' The Boscawen was even commanded by an infantry officer from the 77th Foot. Interestingly, these vessels all have surviving artifacts of and related to flintlock small arms. Naval vessels don't always turn up cutlasses themselves, but the associated gear does reliably appear. Perhaps the lack of swords and cutlasses had more to do with the crew taking those weapons with them than their lack aboard prior to sinking.The 1791 wreck of the Pandora turned up some leather scabbard fragments. The 1798 wreck of the DeBraak, though after my period of study, provides the most complete surviving set of cutlass leather gear. Follower Andrew Lyter of the Zwaanendael Museum in Lewes, Delaware (which displays some of the artifacts recovered from the DeBraak) was kind enough to provide some photographs of the remarkably intact gear. Delaware Division of Historical and Cultural Affairs, Department of the State, photographed by Andrew Lyter, Zwaanendael Museum, Lewes, Delaware. 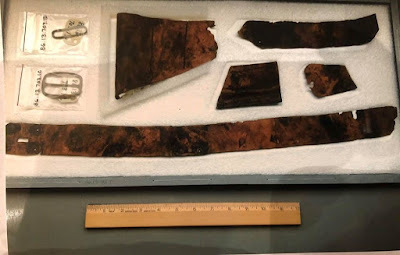 Maritime material culture historian Matthew Brenckle pointed out that some of the buckles recovered from the 1770 wreck of the naval sloop Swift are remarkably similar to that on the belt of the DeBraak. Almost certainly, shore parties were equipped for what their commanders thought would be most useful and appropriate for the occasion. The thirty three officers and men of the Royal Navy dispatched on the Braddock Expedition in 1755 were armed with bright barreled sea service muskets, cartouche boxes, and bayonets, and no cutlasses (much less belts, baldrics, or scabbards). Braddock's Expedition was a long term campaign and the officers in charge anticipated traditional restricted warfare of the eighteenth century style, with the occasional stand up fight brought on through ambush. Bray's men apparently anticipated close in fighting ashore. "Figure of Eight" Naval Cutlass, c.1740-1750, Colonial Williamsburg. All of this suggests that cutlasses were more common on naval vessels than any other sort. Whether naval seamen carried cutlasses ashore depended very much on the particular situation. The sailors of the Braddock Expedition were on a very different mission than the sailor portrayed by Bray. How precisely they carried these implements requires more research than I've given you here. If you know of artwork I've missed, existing baldrics or waist-belts from the period, or primary source accounts that shed more light on this topic, feel free to share them and shed light on this topic. Bowen, Ashley, The Autobiography of Ashley Bowen (1728-1813), edited by Daniel Vickers, Ontario: Broadview Editions, 2006, page 38. Nicol, John, The Life and Adventures of John Nicol, Mariner, edited by Tim Flannery, New York: Atlantic Monthly Press, 1997, page 37. Jackson's Oxford Journal, January 6, 1759, pages 1-2. Boarding helmets are rarely mentioned, and even more rarely researched. William Gilkerson did briefly examine them in his Boarder's Away: With Steel - Edged Weapons & Pole Arms, Lincoln, Rhode Island: Andrew Mowbray Publishing, 1991, pages 104-106. Kerns, Mechelle, London Town: The Life of a Colonial Town, unpublished master’s thesis, UMBC: 1999., page 244, 311, 347. Litwin, Jerzy, et. al., The General Carleton Shipwreck, 1785, Gdansk: Polish Maritime Museum, 2008; Shelley Owen Smith, The Defence: Life at Sea as Reflected in an Archaeological Assemblage from an Eighteenth Century Privateer, doctorate dissertation, University of Pennsylvania, 1986; Switzer, David C., "The Excavation of the Privateer Defence," Northeast Historical Archaeology, Volume 12, 1983, pages 43-50, via Binghampton University, The Open Repository, <https://orb.binghamton.edu/cgi/viewcontent.cgi?article=1297&context=neha>; Bingeman, John H., The First Invincible (1747-1758): Her Excavations (1980-1991), Oxford: Oxbow Books, 2010.
 ; Campbell, Janet and Peter Gesner, 'Illustrated Catalog of Artefacts from the HMS Pandora Wrecksite Excavations 1977-1995,' Memoirs of the Queensland Museum, Volume 2, Issue 1, Brisbane: Queensland Museum, 2000, page 88, accessed July 31, 2018, <https://search.informit.com.au/documentSummary;dn=888899821801914;res=IELHSS>. Personal e-mail communication with the author. Dolores Elkin, et al., “Archaeological research on HMS Swift: a British Sloop-of-War lost off Patagonia, Southern Argentina, in 1770,” The International Journal of Nautical Archaeology, Volume 36, Issue 1, March 2007. Keppel to Barrington, March 17, 1755, 'IV. The Norwich: Letters,' in The Barrington Papers, Vol. 77, ed. D Bonner-Smith, London: Navy Record Society, 1937, 115-165. British History Online, accessed July 31, 2018, <http://www.british-history.ac.uk/navy-record-soc/vol77/pt1/pp115-165>. Thank you, Kyle and Andrew, for including that photo of the sword belt from deBraak: it looks a lot like the rig I use for my mid-century infantry hanger. Perhaps, then, I would not be too far off the mark, if I just left the hanger at home, and stowed my cutlass in the hanger's slightly longer scabbard. Once again, you've brought good research to a question in the community!